Open/save dialogs are used for most file opening and saving operations within Chimera. Several features are common to all open/save dialogs, including how directories are shown and navigated. A given dialog may include additional features, depending on the function or tool from which it is called and whether opening or saving is being performed. 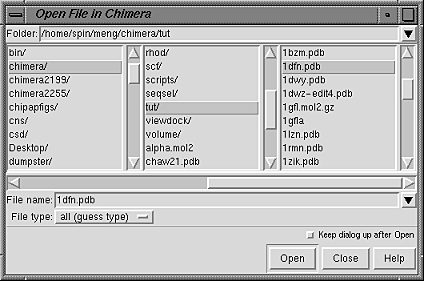 The Chimera Open File dialog is invoked by choosing File... Open from the menu. Any of the registered file types can be opened from this dialog. Certain buttons are common to most open/save dialogs. Open or Save performs the indicated operation and dismisses the dialog (although there is a checkbox option to Keep dialog up after Open). Close dismisses the dialog without performing the operation. The Help button brings up a manual page in a browser window. This most recent location is remembered between sessions if Open dialog starts in directory from last session is set to true in the General preferences. The directory pathname is shown in the Folder field. Other locations can be browsed by clicking a directory name in any of the panels within the dialog; the leftmost panel represents the top of the directory hierarchy, and each panel going rightward represents the next lower level. Recent directories can be accessed using a pulldown menu to the right of the current directory name (marked with a black triangle). When a file is opened or saved, the directory pathname is added to the recent directory list in the preferences file. The recent directory list is shared by all open/save dialogs. More than one file can be opened at a time. After navigation to the desired directory, individual filenames or blocks of filenames can be chosen with the left mouse button. Ctrl-click adds to an existing choice rather than replacing it. To highlight a block of filenames without having to hold down the mouse button, click on the first (or last) and then Shift-click on the last (or first) in the desired block. Only the files with suffixes appropriate for the File type setting will be listed. In many cases, compressed files (*.gz, *.Z) of those types will also be listed and can be opened. The possible File type settings vary depending on the specific dialog. Any of the registered file types can be opened from the Chimera Open File Dialog; if the File type is all (ask type) or all (guess type), all files will be listed. If a tool-specific file type is opened, the associated tool will be executed or started, if it has not been started already. Prefixes cannot be used, and there is no default file type. If a file is one of the registered types but is not named with the correct suffix, it can be read by either (A) setting the File type accordingly and entering the filename manually, or (B) changing the File type to all (ask type), clicking on the filename or entering it manually, and then indicating the file type when queried. The names of recently opened files are available from a pulldown menu to the right of the File name field (marked with a black triangle). When a file is opened, the file pathname is added to the recent file list. The recent file list and the most recent File type setting for each open dialog are stored in the preferences file. Open opens the indicated file(s) and dismisses the dialog unless Keep dialog up after Open is checked. After navigation to the desired directory, the name of the file to be saved should be entered in the File name field (or chosen with the left mouse button, if a file of the same name already exists). The file types and contents that can be saved depend on the function or tool from which the dialog is called. A save dialog may include a checkbox option to Add .xyz suffix if none given, where .xyz is the default suffix for the given File type. When the option is on, a suffix will be added only to a filename lacking a suffix; when the option is off, suffixes will not be added automatically. The names of recently saved files are available from a pulldown menu to the right of the File name field (marked with a black triangle). When a file is saved, the file pathname is added to the recent file list. The recent file list and the most recent File type setting for each save dialog are stored in the preferences file. Save saves the indicated file and dismisses the dialog.